In the 2012 year, the number of group tours over all 7 gardens has increased rapidly, and the total number of visitors to 7 facilities using common tickets has greatly increased to 159.2% compared to the previous year. Both of them seem to have contributed greatly to the increase in the total number of visitors. ■ The theme of 2013 year is "Rose"
2 7 (Sat) - October 6 (Sun). 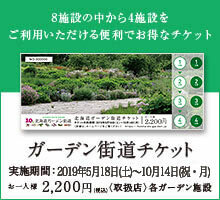 7 Garden Includes affordable common tickets (4 yen) that can enter 1800 facilities.